The goal of this NSI was the development of carbon-neutral alternative energy sources to mitigate global climate change, reduce dependence on foreign oil, improve the economy, and improve the environment. Long-term carbon reduction targets can and likely will be met by a portfolio of technologies, of which solar energy has the potential to play a prominent role. Solar energy is readily available, free from geopolitical tension, and not a threat to the environment through pollution or to the climate through greenhouse gas emission. The development of a solar energy infrastructure will not only support U.S. energy independence but also represents an unparalleled economic opportunity if the United States can maintain scientific and industrial leadership in this field. At the time of the launch of this NSI, the levelized cost of energy generated by solar technology was not yet economically competitive with conventional fossil fuel technologies without subsidies. Therefore, new innovations and fundamental breakthroughs were needed to help accelerate the development of economical solar energy technologies that surpass the limits of existing technologies. 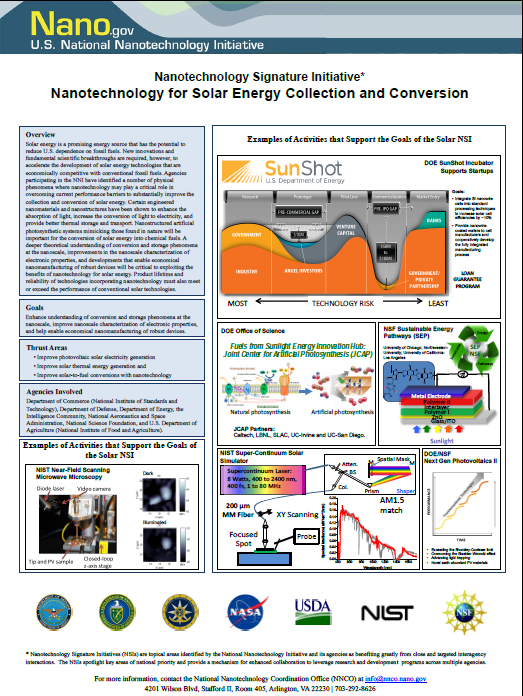 Nanotechnology can help overcome current performance barriers and substantially improve the collection and conversion of solar energy. A number of nanoscale physical phenomena have been identified that can improve the collection and conversion of solar energy. Nanoparticles and nanostructures have been shown to enhance the absorption of light, increase the conversion of light to electricity, and provide better thermal storage and transport. However, current demonstrations of these technologies fall short of potential performance because of poor control over feature size and placement, unpredictable micro/nanostructure, poor interface formation, and in many cases, short lifetimes of laboratory devices. The goal of this initiative was to exploit the benefits of nanotechnology by enhancing understanding of energy conversion and storage phenomena at the nanoscale, improving nanoscale characterization of electronic properties, and helping enable economical nanomanufacturing. Participating agencies include: DOE, NASA, NIST, NSF, DOD, IC, and USDA/NIFA. For progress on this NSI, see the 2015 Status Report.